These twelve essays constitute a groundbreaking volume of new work prepared by leading scholars in the fields of history, anthropology, constitutional law, political science, and sociology, who identify the many facets of what it means to be Métis in Canada today. After the Powley decision in 2003, Métis people were no longer conceptually limited to the historical boundaries of the fur trade in Canada. Key ideas explored in this collection include identity, rights, and issues of governance, politics, and economics. 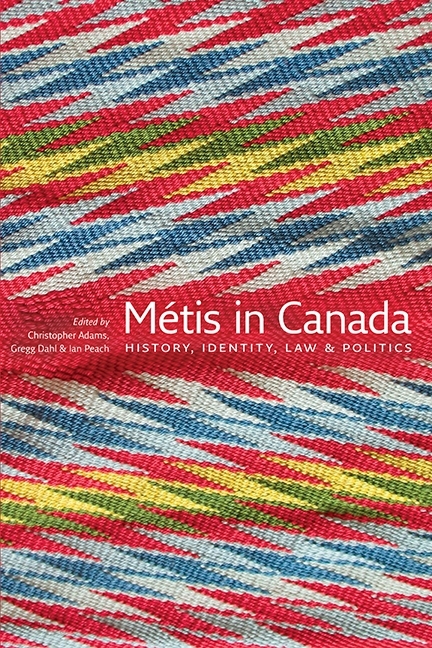 The book will be of great interest to scholars in political science and native studies, the legal community, public administrators, government policy advisors, and people seeking to better understand the Métis past and present. Christopher Adams was Vice President at Probe Research where he directed an annual survey on Aboriginal people in Manitoba. He holds two adjunct professor appointments and is currently the Rector of St. Paul's College at the University of Manitoba. He lives in Winnipeg. Gregg Dahl has had a long career in policy analysis for provincial, territorial, and federal governments. He is a proud descendant of a Half-breed family that lived in St. Paul's parish in the Red River Settlement. He lives in Ottawa. Ian Peach is Dean of the Faculty of Law at the University of New Brunswick. He has had an extensive career with federal, provincial, and territorial governments, as well as in academia and the private sector. He lives in Fredericton.